Truly there is so much more than we have known, as a whole, concerning the Kingdom of God. The promises of Revelations Chapters 2 & 3 are what prompted me to create this site. All the promises are to "those who overcome." This is about Tabernacles. The final feast. Where the overcoming saints are One with Christ in the bosom of the Father. Here God is at rest. The things we will address on this site may sound different from what you hear from many pulpits on Sunday mornings. But as we look into the whole of Scripture, I pray the Holy Spirit of God will reveal to us His whole counsel, His great purpose in Christ for all creation. I am not a man-ordained minister, and have never been to Bible School. My teacher has been the Lord revealing His Truth to me by His Spirit. I've been greatly blessed and influenced by several, mostly older pastors and theologians, but it is the written Word of God to which I return to discover the True promises of God. And again, it is His Spirit that gives me the understanding into what I read and meditate upon. 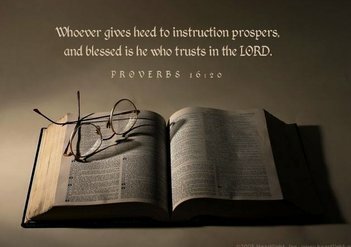 Any wisdom I have has only come because the Lord has granted it to me. 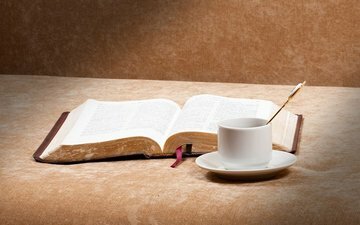 May anything you read or hear here be taken to the Lord in prayer and confirmed by His Word. Let us always be as those in Berea, "examining the Scriptures daily to see whether these things are so." "He (Jesus) is the divine portrait, the true likeness of the invisible God, and the first-born heir of all creation." And this One will have brothers made in His image, truly a New Creation. In depth studies, verse by verse, of Scripture. After a 17-part series on Romans 8, we are looking now at Our Journey from the perspective in 1Corinthians 10. Is it our words or our actions that will determine our Eternal destination? What proves we are in the will of God, saying what He wants to hear, or doing what He has commanded us? Continuing our study of Jesus parables. May we have "ears to hear." The sheep & goats of the nations, standing before the Throne at the Second Resurrection. The First Resurrection overcoming saints are seated with Christ on the Throne. 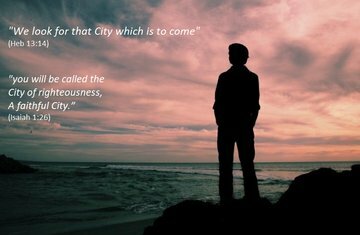 Where will we be in that Day? Continuing our look at the Parables of Jesus on the Kingdom of God. Here a study on the types of ground (heart) onto which the Seed falls. My personal hope I have found in God's Word, and in following the Lord Jesus. These are the things that drive me and cause me to press in to know Him. Click on the Title above to open the essay. Looking here at the Parable of the Talents from Matthew 25, as Jesus continues His teaching on the Kingdom of God. What gift has the Master entrusted to us? “We look for light, but there is darkness! Every day the news is full of accounts of domestic violence, animal abuse, and injustice. So many are hurting. Many are becoming disillusioned. People don't know where to turn for answers. Lord, when will the trouble cease...? A site I highly recommend. This is a publishing company of friends of mine who truly follow the Lord with all their heart, soul, mind and strength. 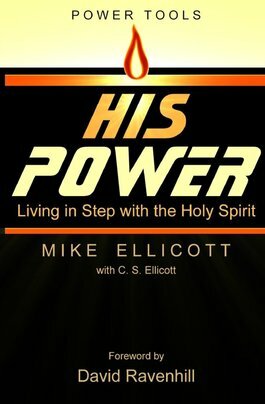 Mike Ellicott & his wife Cheryl have together written an amazing, Biblically sound book called "His Power: Living in Step with the Holy Spirit." 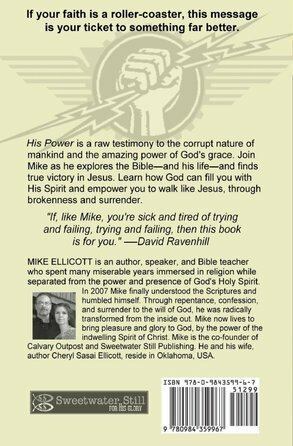 In it Mike shares how the Truth that the Spirit came to lead us into truly changed his life and strengthened his walk with Jesus. As well, there is a Women's Bible Study available on Living in Step with the Holy Spirit. I was blessed to receive advance copies of the book, which will be available on Amazon and in select Book Stores Sept. 8th. Hoping to begin a Bible Study soon, using material in the book as a guideline, and delve into the purpose and necessity of the Spirit in the life of the Christian. Looking at verses on healing in their Biblical context. Looking at perhaps one of the greatest battles in our Christian walk - compromising with the things of the world. A group I started on Facebook, going through the 31 Proverbs, one each day of the month. The journey truly has been revealing over the past 3 years. Also, sharing more from the Word of God, as the Lord continues to reveal Truth in these days in which we are living. May we have ears to hear what the Spirit is saying to us, His Church. Blessings as you walk with Jesus.